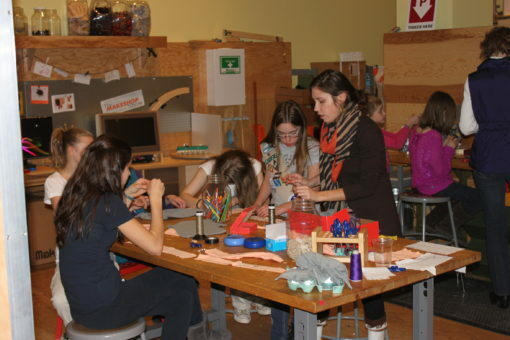 On February 22nd, we held our second Youth Maker Night. This was an after-hours event with a lot of tweens and teens, and no parents. We offered some new activities for the youth to try, including felting, recycled derby cars, e-textiles, tinkering with motors, and a demonstration of a 3D printer. It took the kids awhile to ease into the activities. They had the freedom to choose whatever activity they wanted. Some kids bounced around from space to space while others concentrated on one project while others made up activities of their own. We had a very intensely focused group of boys who spent a lot of time working with our circuit blocks, just like they did at the last event! This time they tried to get a motorized counter to spin as fast as possible. It’s funny, we spent a lot of time thinking of activities for the youth but sometimes it’s best to let them do what they want. 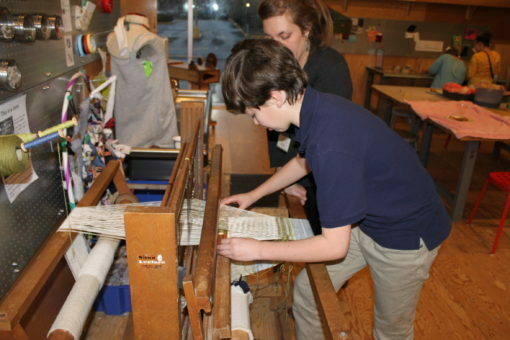 One boy was interested in the loom so we let him work on that. A group wanted to make paper airplanes so we let them do that. We hadn’t planned on doing any electronic tinkering, but that was of high interest. Its hard to predict what this age group is going to be interested in. We are still learning! Of course, the youth still liked the special activities that we provided. There was a group that did sewing the entire time. There was a boy that made the biggest felt ball I have ever seen. There were some kids that spent over an hour simply testing their recycled cars and making adjustments and testing again. 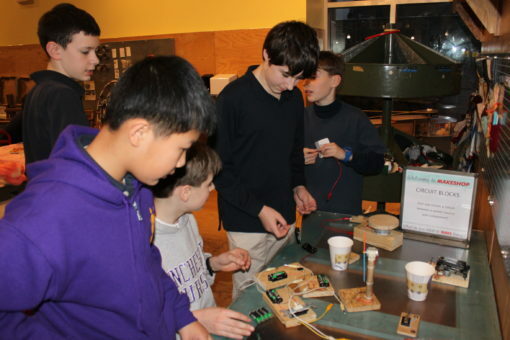 As always, it is a lot of fun to have this age group in MAKESHOP. The space is really set up for teenagers to take full advantage of everything we have to offer. We offer a lot of special programming for children, ages 8-15. Check out our upcoming Making Computer Games Workshop and Computer Programming Workshop.